Good sleep begins with your mattress. Having a proper mattress will help your body relax and help you get a good restful sleep. Not enough sleep or lack thereof can cause a lot of health problems, psychological problems, anxiety, depression, etc. Buying a good mattress is not a small investment. With the proper care, your mattress will last you up to 15 years. So it's definitely worth buying an expensive one. You need to know how to pack and store your mattress when you have to. At some point, you'll need to keep your mattress in storage. Whether you're moving houses, or renovating, or upgrading your home, or are a student that needs storage for the summer. And you should be prepared. Ask any expert who deals with people's storage needs on a daily basis, they will explain to you the difference between storing your mattress correctly and incorrectly. You should be prepared because you may be surprised by the ways a mattress can affect your health and sleep. Here are our tips about keeping your mattress safe in a storage container. You can use a steam cleaner for a deeper cleaning. If you can't find one you can use a regular vacuum cleaner with the mattress tool attachment. Sprinkle baking soda on the mattress and leave it overnight to deodorise and draw out any moisture out of it. Then vacuum it again. Let the mattress air out overnight or for a couple of hours. If the mattress has its own cover that can be removed- remove and wash it. Leaving a dirty mattress into storage will result in getting it out in an even worse condition and likely unusable. So it's incredibly important to clean your mattress. When it comes to wrapping the mattress with something, make sure you do good research and buy the right mattress bag. What you need to find is a plastic mattress covers for storage but as a professional removals and storage company, we advise you on investing in a quality bag. Find a light and breathable plastic cover for both the mattress and for the other parts of the bed- the frame, the headboard, etc. Yes, wrap them in a bag as well. Or at least cover them with a blanket. Thicker plastic covers will trap the mattress’ moisture, if you hadn't taken care of it in advance, and will cause the above-mentioned issues - mould, fungus, bad smell. Even if the mattress was aired out before being packed in the plastic, if the storage container is not in a temperature-controlled environment, the thick plastic can be the cause of moisture and your mattress won't be safe. Be careful where you store your mattress. Do not rely on attics or basements, they can be damp and humid places, the temperature might be changing there from too hot to too cold. None of this is a good place to keep a mattress and the rest of the bed. You can find storage services in London that will allow you to store your mattress safely for as long as you need to, in a completely safe environment. How to store a mattress in a storage unit? Most storage containers are 2.30m/2.10m/1.80m and can easily fit a king size mattress and its other parts. However, there is a right and a wrong way to store a mattress. Especially if the storing period will be long. For a long storage period, we advise you to lay the mattress flat on the ground, so it doesn't deform over time. Its padding might get ruined if it stays upright? for too long. The mattress is heavy and gravity will not spare it. You might go to the storage place to get your mattress after a couple of months and it won't be suitable for use anymore. If there will be other things in the container, do not put boxes or other items on the mattress. They can deform the padding as well and your mattress will be left with hollows in it. If the mattress has to be upright so other things can fit the container as well, try to place it between the wall and another large piece of furniture to keep it straight and in a sandwich, to prevent damages. For a short period of time, it is possible to keep it upright. You just have to be very sure if your renovation will really end as soon as you think and your mattress won’t have the time to get damaged. Read more: How to store your furniture properly. 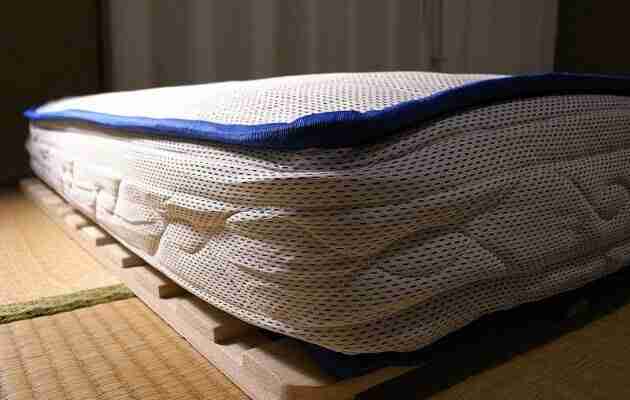 The foam used to make mattresses is very resilient and can hold a lot of weight and restore its original form. Even though this type of mattresses are stored, shipped and arrive at your home rolled up, manufacturers do not recommend that you do the same thing when you have to store a mattress. Especially if it's for a long period of time. For a short period, you could roll it and tie it up, put it in a plastic bag and put away for when you need it. But if you will have to keep it away for a long time, you should not keep it rolled up because it can deform the foam and it won't restore its original form. What you can do is what you do for a regular mattress. Clean and air your mattress, of course. Find a special mattress cover for storage and wrap it well. It is also recommended that you keep your memory foam mattress laying down as well. This way you'll make sure nothing happens to it. The box springs, bed frame, headboard should be disassembled and cleaned before storing them. Use a vacuum or wipe them down to remove dust, hair, and other accumulated dirt or moisture from them. Use mattress cover or a simple garbage bag to wrap them too, so they don't get affected by humidity and dirt. You can also request a cardboard box and other packing materials from your removals company. * Put all screws, nuts and small pieces in a Ziploc bag, and tape it to the headboard so you can have everything in one place. How to clean a mattress that has been in storage? Sometimes despite all of the efforts and preparations you've done before putting your mattress in storage, it comes out smelling bad or it just feels dirty. Strong Move advises you to get your mattress from storage at least 24 or 12 hours before you will need to use it, so you can prepare it. Cleaning the mattress after getting it back from storage includes the same steps as before putting it in storage: sprinkle baking soda on both sides of the mattress to remove the odour. Wait an hour and vacuum the soda away. There are special deodorising sprays you can use, but after that leave the mattress to air out well. Leave it to rest for a couple of hours to restore its form if it wasn't laid flat in the storage container. And the last step is to put your bed together and get a good night's sleep.